The best of Florida's beaches are close-by. Florida has some of the most inviting family vacation beaches in the world. Whether you're looking for a vacation jam-packed with activities, or prefer a quite day spent strolling the shores and building sandcastles, Florida beaches have it all. Soak up the sun on this large pristine Gulf Beach. Lifeguards are on duty daily from 9:30 to 4:30 and many facilities such as beach showers, restrooms, concessions and umbrella rentals are available. Parking is metered. While you are here, don't forget to try your luck at fishing, watch performers or just take in the beautiful sunset from Pier 60. Location: Located in Pinellas County on the west coast of Florida between the Gulf of Mexico and Tampa Bay. Geographic latitude is 27.57 N and longitude 82.48 W.
Location: Located on the Pinellas Peninsula between the Gulf of Mexico on the West and Tampa Bay on the East. Latitude is 27.57 N and longitude 82.48 W.
Caladesi State Park: Winner of the 2008 "Top Beach In America Award" Caladesi Beach, Florida, is located on Caladesi Island, off the West Coast of Florida. Caladesi State Park is one of the only places where you can still experience Florida's pristine, untouched wildlife. Caladesi Beach's unadulterated state is due to strict regulations that make Caladesi State Park accessible only by boat or ferry. approx. 2-hour drive from Kissimmee. With just an hour's drive East, this is the closest beach to Orlando. Cocoa beach is 6 miles long and less than a mile wide and offers a wide variety of action-packed fun to choose from. Hop aboard a casino cruise ship, try deep sea fishing, take a quiet kayak journey, catch a couple of waves on a surfboard, or take flight parasailing! Location: Beachline Expressway (SR528) East . Once you cross the IntraCoastal Waterways, you'll reach Port Canaveral. The Beachline then turns into A1A, leading you straight into the heart of Cocoa Beach. Boasting 23 miles of beaches, Daytona Beach is a white sand dream! Experience driving on the beach daily from one hour after sunrise to one hour before sunset. If you're here from May 15 - Oct. 31, you may be lucky enough to catch the magnificent sea turtles emerging at night to lay their eggs on the beach (as these are an endangered species, extra cautions apply during this season). Lifeguards are on regular duty. While you are here, don't miss popular events such as motorcycle, car & truck shows, rallies, and world-famous motorcycle action on-track at the International Speedway! 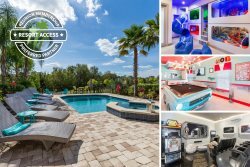 Location: Only 54 miles from Orlando International Airport. Dazzling culturally rich, Sarasota boasts an amazing 35 miles of beaches and 6 barrier islands. Take in the beauty of pristine waters and stunningly white beaches. Explore affluent St. Armand's Circle with over 100 trendy stores! Looking for something unique? Check out the Ringling Museum of Art, or Museum of the Circus while you are here. Into art? There are more than a dozen theatres and 30 art galleries to choose from. You won't be disappointed!